With many of the Bermudian, European and US wholesale insurers hitting 52 week highs last week, there is a definite shift in sentiment about the sector. It remains to be seen whether the shift is simply part of the overall market rally or a more structural shift in the markets view of the previously historic low tangible book multiples. 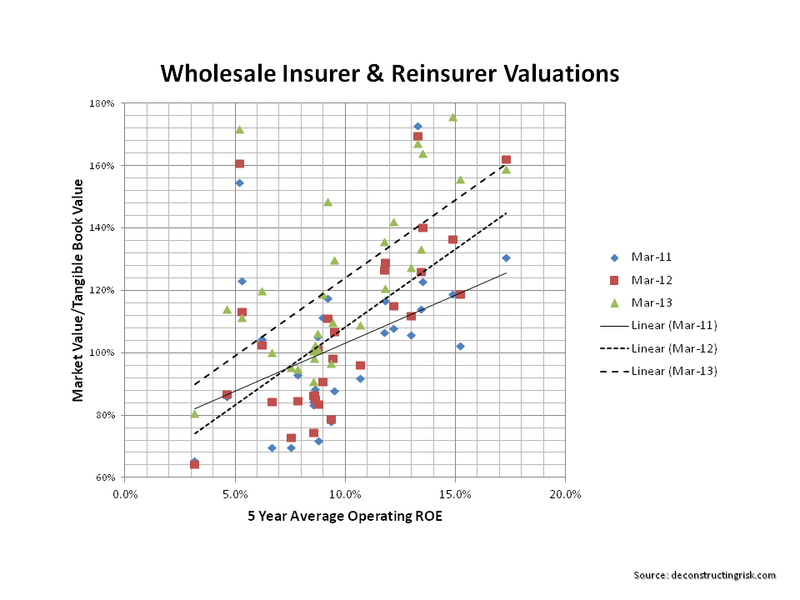 A wide sample of firms in the reinsurance and wholesale insurance sectors are included in the graph below. This entry was posted in Insurance Market and tagged Bermudian insurers and reinsurers, book value multiples, European reinsurers, insurance price tangible book value, insurance price to book, insurer valuation, london based insurers, reinsurance price to tangible book value, tangible book value, tangible book value multiples. Bookmark the permalink.